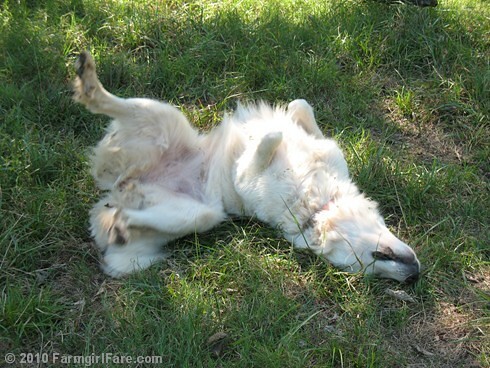 Nobody does relaxed and happy better than dogs. Just getting to know our farm family? 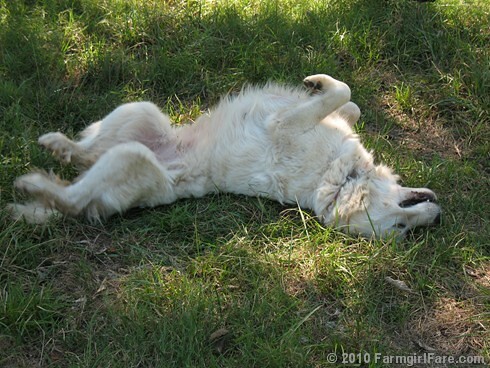 Crazy Daisy is a four year old Great Pyrenees livestock guardian. You can read about how she came to live with us here, and you'll find links to lots more photos of her here. Lucky Buddy Bear is an eight year old (where does the time go?) half Australian Shepherd, half English Shepherd, 100% Attention Hound stock dog. You can find out what all his jobs are here and here. 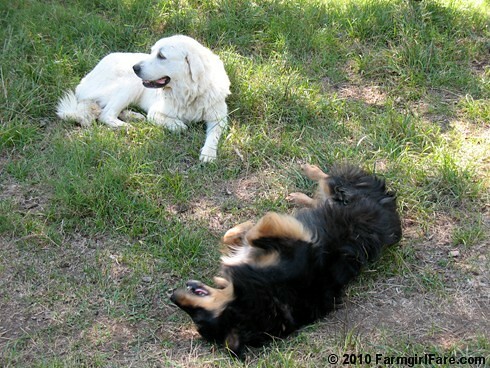 For those of you wondering about Marta Beast, our other livestock guardian—she's doing just fine but was down at the other end of the field with her sheep while I was snapping pictures of these two goofing off. Hot diggity what a lot of fun those two are!! 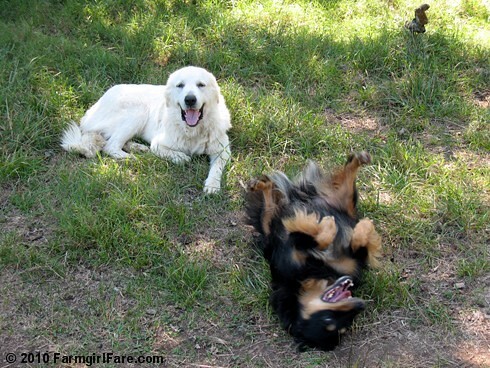 Definitely happy dogs...and I agree...every day is a holiday. These photos just made me smile. Thank you. I makes being up at this hour much nicer. Like you - you labored for Labor Day but with good helpers (and great examples of relaxation) it isn't bad to work. Hope you get a little of the rain we are getting - lovely downpour very much needed by our pastures. We don't have a 100+, but still have the same problem. Gotta feed, water, clean stalls - check on critters everyday! Will be out the rest of the week for my big horse show. Will have a lot of catching up to do next week! Love the pictures of those two blissed out together. We have a 5 month old Anatolian Shepherd pup (going to be a 150 pound livestock guardian) and a 2 year old Australian shepherd. They love to play in just the same style. Homer (the 5 month old Anatolian) is already bigger than Kea (the 2 yr old Aussie). He still won't jump into the truck by himself. Oh dear! We're going to have to solve that problem quick--before he weighs more than 2 sacks of feed! 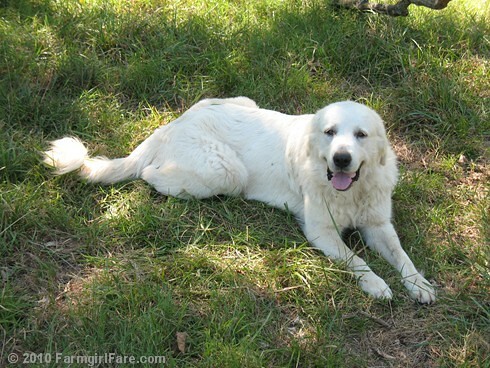 Your dog looks a little small for a Great Pyr...is it just the perspective? Just came across your blog and am enjoying already... we've got the 100+ animals as well and know what you mean about no holidays. Although we did take labor day off from work in the veggie fields! Hooray! The first one totally looks like someone just told a joke and they are both laughing it up! 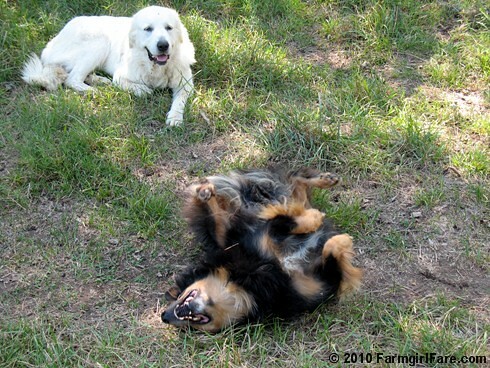 Ahhh to be a doggy on a farm!! What a life!! Thanks for all the nice comments. I'm glad you're loving the photos as much as I am. These two dogs really do crack me up. Welcome to the farm! As for Daisy's size, I think it's just the angle of the photo. She's not huge, but she's probably at least about 95 pounds. You might be able to get a better idea of her size in this photo.